(HAARETZ)—Iran's supreme leader said on Wednesday that Iran would support the Palestinian uprising against Israel "in any way we can," and rejected U.S. accusations that a recent wave of Palestinian knife and car-ramming attacks amounted to "terrorism." Khamenei was speaking a day after U.S. Secretary of State John Kerry, during a visit to Israel and the Palestinian territories, described the spate of attacks as "terrorism" that should be condemned. Israel and the United States have long accused Iran of supplying arms to the Palestinian Islamist group Hamas, considered by Washington as a terrorist organization. Tehran says it gives only moral, financial and humanitarian support. "Despite all the efforts of the Arrogance (the United States) ... and even with cooperation from Arab countries, the Palestinian intifada has started in the West Bank," state television quoted Ayatollah Ali Khamenei as saying. 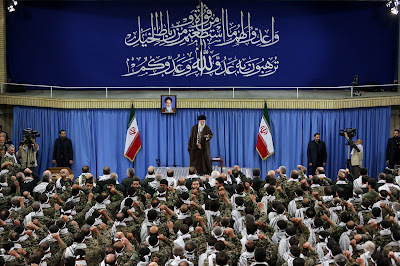 "We will defend the movement of the Palestinian people with all of our existence, and in any way and as long as we can," Khamenei reportedly told a gathering of the Basij, Iran's volunteer militia.